I have sometimes made fun of my wine collector and investor friends, saying that they are engaged in what Thorstein Veblen might have called “Conspicuous Non-Consumption.” They buy some fine wines for the purpose of not enjoying them in the glass, or so it seems at times. Owning the wines and visiting these great wines in their climate-climate-controlled secure storage lockers is pleasure enough. Drink them? Horror! Then they’d be gone! OK, I know it is more complicated than this, but you get the idea of the joke. Now a fascinating report from liv-ex.com, the fine wine market trading platform and research center, suggests that non-drinking of great Bordeaux wines must be considered along with another phenomenon that would make even Veblen scratch his head: producers who make a business of not selling their wines. Or not selling very much of what they produce. “Final Thoughts on Bordeaux 2015” is the title of a Liv-ex report that tries to make sense of the recently concluded Bordeaux en-primeur campaign. This year’s market for 2015 wines was unusually complicated, the report indicates. Vintage quality varied greatly by sub-region, for example. And while critics gave the wines high markets overall, they didn’t do so consistently, which is important since the speculative value of a 97 score (Suckling’s overall rating of the vintage) is very much greater than 94 points (Wine Spectator‘s evaluation). Add to this exchange rate changes in the run up to the Brexit vote and you have a recipe for confusion. But all of this doesn’t really explain the fact that seller prices were well above what the market expected and so not much wine changed hands (at least compared with a few years ago). The opportunity to re-set the market, which the Liv-ex analysts had anticipated, was apparently wasted. This wasn’t a universal situation, the report makes clear. 2015 was the best vintage ever for some producers and the market accepted the higher prices. And some producers offered necessary discounts to move their stocks. But many raised prices and seemed content with meager sales and big retained stocks. Why? The answer, according to Liv-ex, is complicated and begins with today’s historically low interest rates, which make the cost of carrying inventory low. Fine, but don’t they need to sell wine to pay costs? Yes, Liv-ex explains, but the margins on the grand vins are very high and so most costs can be covered quickly with an initial tranche of sales. Second- and third-wines provide additional cash flow. France’s high tax rates are also mentioned — postponing revenue is also postponing taxation (possibly until a more business-friendly administration takes office). But perhaps the biggest factor, which contributes to the “new normal” that Liv-ex sees, is a change in the economic structure of the business. Profits from making and selling wine are now less important than maintaining and advancing the capital value of the chateau itself. Selling wine at a lower but very profitable market price is old news. Raising price to enhance reputation and capital value is the new strategy. The combination of the factors described here combined with similar incentives for the negoçiants results in prices generally above what consumers are willing to pay, the Liv-ex study concludes. The 2015 Bordeaux market was an improvement over 2014, but this is a “low bar,” the study says. “Moreover, for as long as the current environment — distorted by low interest rates — persists, there will continue to be a standoff … ” between supply and demand. The Liv-Ex researchers study Bordeaux closely, so their theory is probably correct, but as I read the report I couldn’t help thinking of one of the most famous microeconomics theories of the first half of the 20th Century: Hotelling’s Rule, named for Harold Hotelling. Hotelling was interested in the rate at which a firm exploits a finite resource that it owned, assuming the usual (for economic theory) perfectly competitive market environment. To over-simply, the objective is to maximize the present value of the finite resource and so the short-run production decision depends on whether market price is expected to rise faster or slower than the rate of interest. If price is expected to rise faster than the rate of interest, it paid to hold back production for the future. If price is expected to rise more slowly than the rate of interest, then selling now and investing the returns makes more sense. Under theoretical conditions, the equilibrium occurs when market price rises at an exponential compound interest rate. A given vintage of a particular wine is indeed a finite resource to be sold today or sold tomorrow. Interest rates today are extremely low and so only very modest expected price increases are necessary to induce a winery to hold back stocks. At zero interest, prices need only remain steady to make stock-building a viable strategy. The incentive to retain inventory is stronger than this, in fact, because the Bordeaux fine wine market is not perfectly competitive and restricting supply of a particular classified wine raises its current price. So in fact withholding stock may allow a wine firm to have its revenue “cake” today (scarcity premium for the wine that is sold) and eat it tomorrow, too (in the form of future sales of the retained inventory at prices above the low compound interest bar). All else being equal, when market interest rates inevitably rise, this will shift the calculation towards current sales. But in the meantime, No Sale is the name of the game. I don’t think this application of Hotelling’s Rule is a better explanation than the Liv-Ex analysis or inconsistent with it, but it does open up a different way of thinking — looking at the situation in terms of the present value of the income stream. It is possible to take this way of thinking too far, however, which is what New York Times columnist Frank Bruni hilariously did earlier this year when he wrote an “April Fools” column about college admissions. He announced that Stanford University had taken selective admissions to its logical extreme … and admitted zero percent of its applicants! Because it was now totally unattainable, Bruni reported, Stanford was even more ardently desired than before and admission applications and strategic financial donations poured in. In Bruni’s fictional world, zero admission “sales” maximized Stanford’s reputation and revenue stream. Wow! I wonder if that would work with wine? Whatever you do, don’t let the folks at Lafite, Latour and Margaux read Bruni’s column. 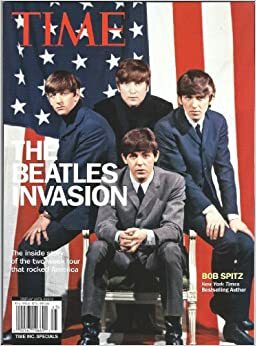 The Beatles’ Boeing 707 landed in the USA on February 7, 1964 and pop music has never been the same. It isn’t that the British Invasion conquered American pop music as much as that a creative dynamic was accelerated. The influence can still be felt more than 50 years later. Another invasion took place from about 1970 to 1990 when a number of Europeans made significant wine investments in the United States, stirring the creative pot in ways big and small. Last week I talked about the Skalli family’s Mondavi-inspired investment in St Supéry and the recent sale of that property to the brothers who own Chanel. That event got me to thinking about the other invaders. Where are they now? Here are a few quick case studies. Domaine Chandon, for example, has thrived as a sparkling wine producer and now also a maker of fine still wines. Chandon California (1973) is part of Moët Hennessy’s global luxury wine portfolio that also includes Newton Vineyard in Cailfornia, Chandon Argentina (1959), Chandon do BrazIl (1973), Chandon Australia (1986) and Chandon China (2013) as well as Cape Mentelle, Cloudy Bay, and other famous brands. Chandon was not the only French firm to invest in the California wine industry. Boisset, known today for DeLoach, Raymond, and Buena Vista wineries among others, came on the scene in the early 1980s. In fact, Boisset sold Robert Skalli the Rutherford property on Highway 29 that became the St Supéry winery. Boisset first entered the California market as an importer and producer in 1980. The Rutherford property was purchased in 1982 (the Victorian home you see there was used as a summer residence for a couple of years). But it was sold to Skalli in 1984 as the result of a strategic shift to focus to building the company back in France rather than expanding further into California. 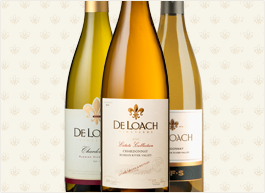 Jean-Charles Boisset returned in California in 2003 with the DeLoach purchase and has gone on to become an integral part of the wine industry here with a large wine portfolio and deep local roots. He is married to Gina Gallo and the couple live in the old Robert Mondavi house. Donald Hess wasn’t looking to start a winery when he came to the U.S. from Switzerland in 1978, although he ended up creating the Hess Collection vineyard and winery on Mount Veeder and starting an international wine portfolio that now reaches out to California, Argentina and South Africa. Hess wanted to produce and sell bottled water in the U.S. and he traveled across the country looking for both a production source that appealed to him and evidence that there was a growing market for bottled water. Having failed on both fronts when it came to water (he was obviously just ahead of his time), Hess became inspired by some of the wines he tasted and changed direction. He invested first in the vineyards high up on Mount Veeder and then took over the historic Christian Brothers winery up there, which is quite an inspiring place to visit now that Hess has strengthened and restored it after the Napa earthquake. Hess’s signature modern art collection is spectacular, too, and some of the wines we tasted were memorable indeed. As we drove the winding road to Antica Napa Valley I had that feeling of déjà vu: have I been on this road before? Impossible? Nothing much out here except Antica Napa, the Antinori family’s Napa Valley winery (the Antinori are also involved in Stag’s Leap Wine Cellars and Red Mountain’s Col Solare in partnership with Ste Michelle Wine Estates) and this was our first visit. But I think I had been there before, back when it was called Atlas Peak. The winery and its famous cave system are a fascinating story. Piero Antinori first came to California in 1966, when Robert Mondavi was just starting out with his new winery. Antinori fell in love with the place and started a slow, thorough search for the right path to enter the region. He finally found it in 1986 when he entered into agreement to purchase land for vineyards and a site for a winery in the beautiful Atlas Peak area. Antinori formed a partnership with Whitbread, Inc., the British brewer, and Christian Bizot of Bollinger Champagne, who were also keen to get a toe in the U.S. pond. The partnership did not go quite as planned (a long story that Richard G. Peterson outlines in part in his new book The Winemaker) and in 1993 Antinori bought out the Whitbread and Bollinger shares and in 2006 renamed the operation Antica (Antinori + California) Napa Valley. The road from 1966 to today has been as full of twists and turns as the road to the winery itself and I think it is fair to say that the journey continues with growing confidence. The Townsend Vineyard Cabernet Sauvignon we tasted speaks volumes about this winery’s capacity, vision and direction. No one remembers for sure, it is said, whether it was Mondavi who approached the Rothschilds or if it was the other way around, but whoever had the idea for a French-California partnership it proved to be a good one. The terms were simple: fifty-fifty. No one had a controlling interest, everything had to be mutually agreed. The first Opus One wines were made in 1979 and 1980 and in 1981 a single pre-release case sold for $24,000 at the Napa Valley Wine Auction. It was the highest price ever paid for an American wine at the time and still quite a lot of money for a case of wine today. The first wines were released in 1984. The landmark winery sits just off Highway 29 across the road from the Robert Mondavi winery where those very first wines were made. The dramatic architecture of the winery gets all the attention, but the vineyards are the important thing here. Opus One counts part of the historic To Kalon vineyard as a key asset and component in its wine. Constellation Brands purchased Mondavi in 2005 and inherited half ownership of Opus One. The Rothschilds considered buying out the American half interest as was their right under the founding agreement, but opted instead to keep the winery with a foot in both wine worlds. Constellation and the Rothschilds reached an agreement to remain partners while assuring the winery’s independence and integrity. I admit to being surprised when I learned about the Constellation side of Opus One. I could not imagine that the Mondavi family would structure things in a way that would allow this jewel to slip away. But things don’t always turn out the way we plan and perhaps this quick survey of the European Invasion shows just how diverse the experience has been for those who came to America in the 70s and 80s to make wine here (and for American winemakers, too). The Curious Dominance of Family-Owned Wine Businesses in the U.S.
Last week’s column about the rise and fall of the Taylor Wine Company of New York raises a number of interesting issues and one of them is the singular importance of family-owned and privately-held businesses in the U.S. wine industry and the very mixed record of publicly-listed wine corporations. In retrospect, a case can be made that Taylor’s downfall began when they made the initial move from family ownership to public corporation. The conventional wisdom holds that family-owned and privately held firms can be very successful, but their scale and scope are necessarily limited. Corporations, it is said, can have better access to capital and may be able to negotiate risk more successfully because of limited liability structure. You might expect the largest firms in any given industry to be corporations and this is true in some industries, but not in others. Wine is one exception to the dominant corporation rule. Here (above) is a table of the ten largest wine businesses in the U.S. market (measured by estimated or reported volume not value of sales) for 2014 and 2003. The data are from Wine Business Monthly, which publishes an analysis of the 30 biggest U.S. wine firms each February. I’m looking at just the top ten to keep the analysis simple, although I should note that these ten firms collectively account for about three-quarters of all wine sold in the U.S. You can find a link to the whole list at the end of this column. Looking at the 2014 data, you will note that only four of the top ten firms (those in italics) are public corporations or subsidiaries of public corporations. The other six are family-owned or, like The Wine Group, privately-held and together they produce more than half of all the wine sold in America. The bias towards private- and family-ownership is even stronger if we look at the next 20 wineries where only a few corporate names like Pernod Ricard make the list. The picture becomes even more interesting if you look at the list for 2003, the first year that Wine Business Monthly released its Top 30 report. Many of the players remain the same, but the names of three public companies (shown in boldface) that were in the top ten a dozen years ago have disappeared by 2014: Beringer Blass Wine (now part of Treasury Wine Estates), Robert Mondavi Winery (now part of Constellation Brands), and Brown-Forman Wines, which sold its big Fetzer wine business to Concha Y Toro in 2011 so that it could focus on spirits. Concha Y Toro is #11 on the 2014 list. Looking closely at the 2014 numbers it is hard not to be impressed by the growth of family firms Delicato and Jackson Family Estates and also the success of Ste Michelle Wine Estates, which seems to behave like a privately-held firm even though it is a subsidiary of a public one, albeit in a different line of business (Altria specializes in tobacco products, not drinks). Family- and private-owned wine companies are if anything more important today than they were before the Great Recession. Why are family-owned wineries so vibrant despite their structural economic limitations? The conventional answer to this question — and there is in fact a substantial academic literature dealing with family businesses and even family wine businesses — stresses the ways that family businesses take a multi-generational approach and are able to negotiate the trade-off between short run returns and long run value. Corporations, it is said, are sometimes driven too much by quarterly returns and end up sacrificing the long term to achieve immediate financial goals. When business requires a long run vision, it is said, families gain an advantage. Wine is certainly a business where it is necessary to look into the future if only because vines are perennials not annuals like corn or soybeans and successful brands are perennials, too. Another school of thought examines issues of trust and transactions costs within the firm and the ways that family ties can reduce internal barriers and make interactions more effective. It is commonplace to say that wine is a relationship business and family firms may have advantages in this regard. I have knows some family wine businesses that even go out of their way to work with family-owned distributors and so forth. I think one author saw family-to-family links (the Casella family and the Deutsch family) as keys to the success of Yellow Tail brand wine. There are good explanations for the success of family-owned wine businesses, but sometimes they feel a bit ad hoc, tailored to explain a particular case and less capable of generalization. And they often fail to fully account for the fact that many family businesses (and family-owned wine businesses) either fail or, like the Taylor family, end going over to the dark corporate side. 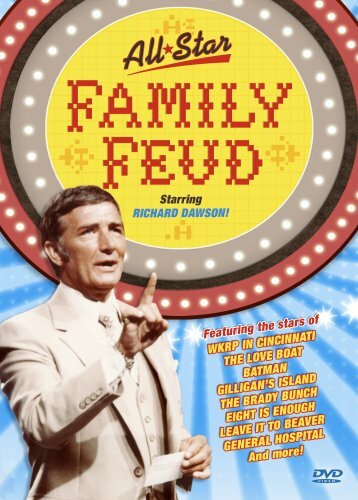 Family relationships can be good, bad or ugly — you cannot think of the Mondavi family story without channeling an episode of Family Feud) and not every new generation wants to stay in the business. So there must be something more here than simple families think long-term. But maybe we are actually asking the wrong question. Maybe the question isn’t why family-owned wine businesses are so strong and instead why corporate owned wine businesses are sometimes so ineffective. Is there something about wine that turns smart corporate brains to mush (not all of them, of course, but maybe some of them)? Come back next week for some thoughts on this provocative question. You can view the February 2015 issue of Wine Business Monthly here. 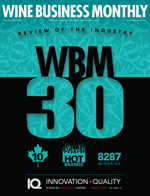 The story on the Top 30 wine U.S. wine businesses begins on page 40. The best way to make a small fortune in the wine business is to start with a big one. What happens when you combine these two old sayings? Well, you would think that it would add up to the fact that if crime doesn’t pay, then wine crime really doesn’t pay. But that may not be true. How else can we explain the recent fine wine crime wave, which may well be just the tip of the iceberg. Most of the attention has been focused on Rudi Kurniawan’s recent conviction for wine fraud — the first federal criminal prosecution and conviction for wine counterfeiting. This dramatic crime and the revealing trial has really captured the public’s imagination in part, I think, because of the romance associated with rare wine and the “lifestyles of the rich and famous” environment of the crime, the criminal and the victims. There’s also a bit of what you might call a “Lance Armstrong” effect. The crime went on for years along with accusations, defenses and denials. Then suddenly there was the trial, the conviction and the house of cards collapsed. Now we are left to wonder how widespread this sort of wine fraud might be and what wines are true and which are false. The conviction isn’t the end of the story, only the beginning of the next chapter in the mystery. The Thanksgiving Day wine heist in Seattle was a grittier affair but perhaps equally interesting to wine crime buffs. I’ve been trying to piece together what happened from published reports and private sources. The more I learn about it the more this crime reminds me of something from a television show — CSI or maybe Mission Impossible! Two “common thieves” (plumbers by trade, according to the Seattle Police) broke into the wine storage facility operated by Esquin wine merchants in the SoDo neighborhood (SoDo stands for South of the Dome — the Kingdome sports stadium in this case, which was demolished by implosion in 2000). They ransacked 15 of the 450 private storage lockers in the climate-controlled facility and made off with more than 200 cases of wine valued at more than $600,000. If you are doing the math, that’s an average of more than $3000 per case or more than $250 per bottle. I’m guessing that no Two Buck Chuck was taken! The break-in was ingenious — the perpetrators apparently cut a hole through a wall and brought the wine out case by case. Police report that the crooks spent 13 hours selecting their wines and then driving the loot to another warehouse less than a mile away. Their SUV getaway vehicle had limited capacity, so they had to make 9 round trips. Although they blacked out all the security cameras that they could, apparently this was not completely successful and some images of the crooks and their SUV’s license plate were captured. You would think that “common thieves” would not be terribly discriminating wine shoppers — after all I suspect that most of the bottles and cases at this storage facility were of some value. Why not just smash and grab? But that’s not what happened. The bad guys apparently worked from some sort of shopping list, taking specific wines and vintages and leaving the rest. I’m told that the only Washington State wines taken were Quilceda Creek and Corliss, for example. Leonetti and Andrew Will? Apparently not up the discerning crook’s standards! I understand that wine was not just stolen, but also moved around and mixed up during the extended shopping spree and a few of the victims are apparently having to sort out which wines are theirs and which belong to someone else as well as which bottles have gone missing. A good old-fashioned paper trail of evidence helped solve the crime and now opens the door to other possible heists. The first criminal captured had apparently kept receipts from a home improvement store — great idea in case you need to return an item! — and police used the day/time information on the paper to access security camera footage showing the suspect and his accomplice buying the hardware used in the criminal act. According to the Seattle Times a second paper trail opens the door to an earlier wine crime. A shipping label found in Harris’ wine-storage locker led detectives to a San Francisco wine consultant, who told police he purchased $100,000 of wine from Harris and another man in April or May, charging papers say. Through an online search, Detective Don Jones determined there had been a large wine theft in the Bay Area in March, the papers say. A KOMO news report added a another Mission Impossible-style detail about the carefully plotted plan to crack the wine storage facility. New details from the charging documents filed Monday reveal police found a journal labeled “The Plan” in Harris’ SUV. The journal reportedly included a step-by-step guide to the crime, a list of needed equipment, steps to destroy any evidence, steps to ship the wine and how to leave the country. In addition, police found a book titled “Thinking About Crime,” as well as printed out documents called “Is it Accidental Fire or Arson?” and “How to Commit the Perfect Crime,” inside Harris’ house, according to the charging documents. Where does the arson come in? Well, the thieves planned to cover their tracks in the most comprehensive possible way. They cut gas lines and expected the building to blow up. Good fortune prevented any loss of life and good police work captured the criminals. Some of the victims are more upset about the idea of the flaming cover-up plan with its potentially tragic consequences than the actual robbery. So case closed for now — the thieves in custody and a good chance that most of the wine (minus one empty Champagne bottle) has been recovered. But are these two common thieves the whole story? Or is there a criminal mastermind (not necessarily Rudi K) still at large making up a shopping lists for clients too smart to buy fakes but maybe not too smart to avoid stolen goods? Good question! So welcome to the new era of wine crime where the questions a fine wine enthusiast needs to answer now range from red or white and Burgundy or Bordeaux all the way to real or fake, stolen or legit? Cheers! I can’t resist adding the opening credits from the Mission Impossible television show. 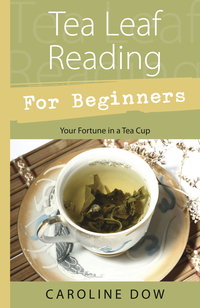 My third column on the fine wine investment market for Wine-Searcher.com appeared recently — it’s an end-of-year analysis called “Reading the Fine-Wine Tea Leaves.” Tea leaves? Yes, because I look ahead to 2014 using the recent Hong Kong auction results as my “tea leaves” leading indicator. Please click on the link to read the whole article — be sure to leave a comment if you agree or disagree strongly with my analysis. One of the missions of The Wine Economist project is to promote objective analysis of the wine industry — to treat wine as a business, which it is, and not as a completely special “planet wine” where the laws of physics (and economics) don’t really apply. Although it is fair to say that I am still getting the hang of writing about the very specialized fine wine investment markets, that’s what I try to do with my Wine-Searcher columns, too. One of the points I make this time is that we perhaps should not be too surprised that the blue chip fine wine market (read “Bordeaux”) is not booming right now. If fine wine is an “alternative investment” category like gold, for example, then it is natural that interest wanes when there’s a boom market for more conventional investments (the alternatives to the alternatives, if you get my drift). Equity indices are up strongly in the U.S. and Japan this year. Gold — perhaps the ultimate alternative investment asset — is sharply lower. Should we be surprised that Bordeaux-heavy fine wine investment indices (which have declined much less than gold) are not on the rise? That said, I am cautiously optimistic about fine wine investment in 2014. Read the Wine-Searcher column to find out why! 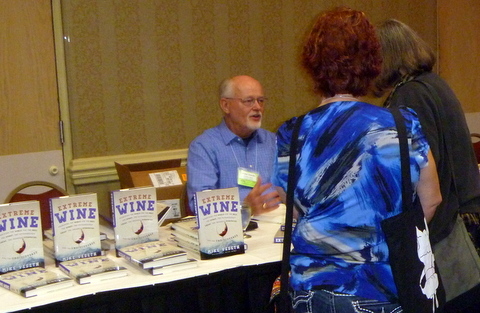 Special thanks to Wine-Searcher editor Rebecca Gibb for her help.